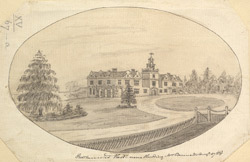 View of Rothamsted Manor House, near Harpenden in Hertfordshire. The manor is based around a small 13th century timber frame house owned by the knight Richard de Merston. The house has been added to many times over succeeding generations of owners but it was Sir John Wittewronge who gave the house its distinctive Jacobean look in the 17th century. Curvilinear gables were superimposed on the originals, a clock tower was added and the moulded chimneys were built. Further work was carried out to the grounds in the Victorian period and then in 1931 the house was sold to the Rothamsted Experimental station and it was converted it into a hall of residence.